Whether family members or people visiting have allergies, it’s easy to become stressed about cooking for Christmas. 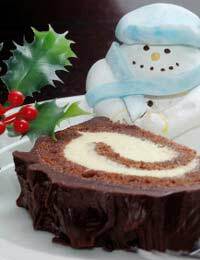 Here are a few hints and tips to make allergy-free Christmas food easier - and see also 'An Allergy Free Birthday Menu' for additional ideas. It is a lot easier to buy allergy-free food and ingredients than it used to be, and many supermarkets have their own brands of ‘free-from’ foods. Though it might take longer, it can sometimes be simpler to cook allergy-free food from scratch, as it makes it easier to control what goes into the food, and can provide a lot more choice. If buying food from the general sections of supermarkets, be prepared to check ingredients lists carefully, and read up on what ingredients are – for example, whey protein, casein and lactose are all derived from dairy products, and textured or hydrolyzed vegetable protein could suggest the presence of wheat. Instead of using ordinary breadcrumbs in the stuffing for the turkey, use crumbled cornbread (made with cornmeal and wheat-free baking powder). Cornbread made with fine slices of chilli and whole sweetcorn kernels and served warm also makes a delicious alternative to bread rolls, and can be made to be dairy-free as well. When making gravy, use cornflour and stock or meat juices (spoon the fat off first to reduce the fat content) rather than gravy powder or gravy granules. There are gluten-free flours (including soya flour, potato flour, tapioca flour, gram flour, buckwheat flour, cornflour and rice flour, and blends of different flours) available to make pastry, cakes and biscuits. Gluten-free flour handles differently to wheat flour and can require more liquid, so check out websites and gluten-free cookery books for specific recipes. Generally, ordinary recipes that don’t use much flour (such as those for Christmas puddings and Christmas cakes) can easily be adapted to be wheat-free (and often dairy-free too). Some recipes, generally quite rich cakes, use ground almonds instead of flour. As a change from Christmas cake or Christmas pudding, make fruit-based desserts, for example pears simmered in fruit juice with ginger, or make homemade ice cream (based on gluten-free custard) or frozen yogurt, packed with fruit, nuts and spices. Substitute butter with dairy-free margarine (available from most supermarkets) or vegetable oils in cooking and baking. When mashing potatoes, to make them softer and richer, use a dab of dairy-free margarine, an egg yolk or a little olive oil instead of butter and a dash of soya, oat, rice or nut milk (or dairy-free cream substitute) instead of dairy milk or cream. To go with the dessert, use soya, oat, rice or nut milks instead of cow’s milk to make sauces and custards, and there are dairy-free ice creams and cream substitutes as well that taste pretty good. There are a number of egg substitutes available (try health food shops) that can be used in place of eggs when cooking. Many Christmas recipes, especially stuffings and desserts, feature nuts quite heavily, but there are alternatives. Try using chopped dried apricots or figs, or other dried fruits such as cranberries in cakes and stuffings. Cooked brown rice will also add texture and a slight nuttiness to stuffings. Instead of putting marzipan (made from ground almonds) on the Christmas cake, just use fondant or Royal icing (brush it with warmed apricot jam or shred-free marmalade before putting on the fondant icing), or leave the cake un-iced and decorate it with pretty crystallised fruits.